Francesco Lamperti made much of it, this thing called breath. But he thought about it quite differently than students of singing today, who are trained to think about breath in physiological terms. Lamperti, rather than expounding on the physiological aspects of breath and breathing, simply made his students sing on it. The voice had to be on the breath. This introduced the student to the concept of a column of breath, which was something more than the amount of air in the lungs. In and up on the breath. That was Lamperti's teaching. The student was taught to hear and feel the start of the tone in the middle of the head. 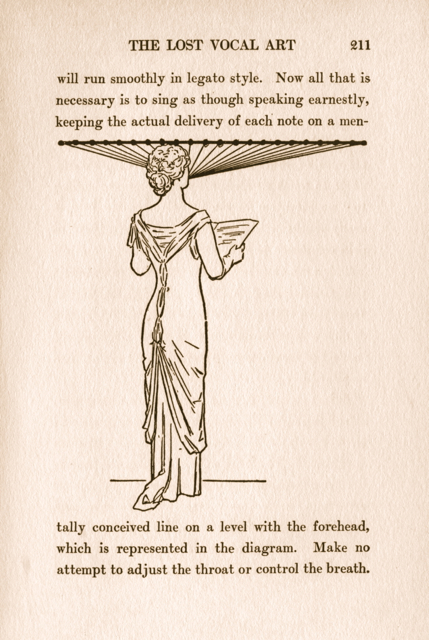 The student was also taught to do this in a mezza-voce manner. Think that was easy? Think again! Most students sing in a breathy fashion when attempting this. To obtain a sense of Lamperti's teaching of singing on the breath, the autodidact is encouraged to silently pant in a pulsing fashion—inwardly—for 10 to 15 seconds without stopping—a teaching also from Lamperti's studio. Every muscle of the torso and head will be felt to lift. As far as this is concerned, Lamperti taught that breath should be separate from the tone, a mind-bending proposition for those fixated on physiology and subglottal pressure (see my posts on Giulia Valda for more information). But there is no need to make things complicated. Keeping the feeling obtained while panting inwardly and silently—which is felt from pelvis to crown of head—will reveal much. Of course, this is where things get interesting, since the student must have some idea of the tone that is going to be spoken or sung. The ear has to educated, and that is a whole other matter. There I was, rowing away at the Y, when I heard the loudest music for an aerobics class in the studio next to me. Sure. We've all been there, right? Walk into any gym and there will be an exercise class with people jumping around and music blasting. I didn't get upset. Didn't lose my nerve. No, none of that. Rather, I got curious. Just how loud was this sound anyway? 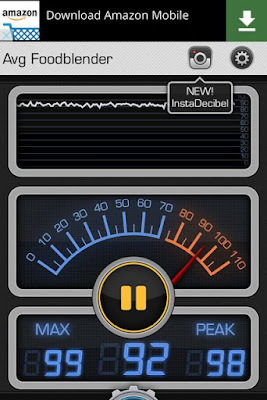 You'd think I would have downloaded a decibel App on my iPhone already, but no. For some reason (and I have more than enough reason to do so, believe me) hadn't done that yet. But I was really curious about how loud the sound was. 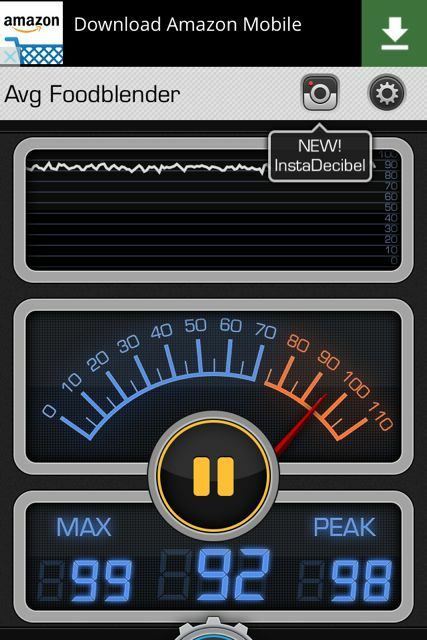 So I finished rowing (great stuff I have to say), and downloaded a free App called Decibel 10th. I walked to the door of the exercise studio, a huge room, turned on the App, and watched the dial move all the way to the right, right into the danger zone. Will you look at that?! Mind you, I wasn't in the room. I was standing in the doorway, a good 40 feet from the speakers. How loud was it where everyone was jumping around? See here for a chart depicting dangerous levels of sound. In singing, see that the neck and head are in a free and loose condition. If the voice is focussed forward as evidenced by pure and beautiful tones, the breath will economize itself. Mange the voice with the ear. Don't manage or try to manage the vocal mechanism. When the muscles in the neck are in evidence during song, it is a positive indication that the tone is not well produced. When the corners of the mouth are drawn back, the tone will become hard and strident. Mouth or facial muscles should not be rigid or set. Never smile artificially. The smiling countenance representing joyousness must be a natural result of happy thought. It is spiritual in its origin. In general, the singing voice of the Italian is characterized as open or closed. "Piu aperto" or "Piu chiuso" representing their preference. The consensus of opinion, however, is that "Piu Canta, Chiuso Canta diesci anni di piu" (He who sings closed sings tens years longer). The import is that the use of the voice well focussed forward is more conducive to its long life. Students should realize the importance of doing small things well. If this is attended to, the big things will take care of themselves. Always sing exercises with strict attention to tone quality. In regard to all graded exercises—so-called methods—always remember that the important consideration is not what you sing, but how you sing it. Forcing the voice is generally the result of either the desire to sing too loudly or with too big a tone, or of attempting to locally adjust the vocal mechanism; in short, singing with the throat instead of through the throat. The natural position of the voice in effect, unhampered by rigidity of the body and sympathetic rigidity of of the throat, is forward in the mouth. Correct forward placing is never forced. —The Lost Vocal Art and Its Restoration by W. Warren Shaw: 197-198. Find this text on VoiceTalk's download page. It's one of the really good (and forgotten) books on the Old Italian School of singing. I've not forgotten him. The guy with the tight eyes and loud unmanageable voice who sang for me in a masterclass. No matter the suggestion or instruction, nothing made a difference—his voice remained hollow sounding. His wife told me he had Aspergers. About a year later, I worked with another man who had the same tight, wary eyes and analytical nature, and again heard the same hollow quality. He also told me he had Aspergers. What's up with this? I wondered. Two guys with the same look and sound. So I started reading and researching, and called a colleague who routinely works with Asperger clients, who told me that, in this case, the biology of the brain trumps everything. 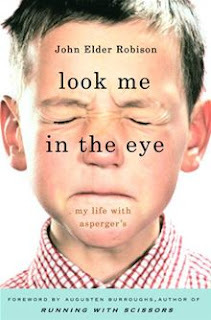 Apserger syndrome first entered many people's consciousness through Jon Elder Robinson's excellent memoir, Look Me in the Eye, which was published in 2013. Interestingly, that same year, singers and voice teachers learned that Susan Boyle—the popular Scottish singer, was also diagnosed with the syndrome. If you've taught singing for a while, you have undoubtedly worked with someone who falls on the autistic spectrum of disorders—in which those with Asperger's are now classified. And if you have, you have encountered the same vocal quality I have observed. My advice? Let it be. Why? The face in the photo says it all. If we understand that the facial nerve inserts into the ear, and that facial expression reveals how the ear is processing both the inner and outer world of sound (this was the clinical observation of Tomatis), it can be understood that the Asperger voice student experiences a unique audio-vocal expression.